I have always been a fan of Rick Owens, the laid back, off beat silhoette his pieces create always looks really cool, and they are equally easy to wear. As you know i like to keep abreast of the latest fashion and will not let pregnancy stop me from expressing my sense of style. Enter Rick Owens. Some of his new SS11 denim collection, DRKSHDW, is prefect for dressing a burgeoning bump! I especially love his cotton swing t-shirt and draped denim vest. 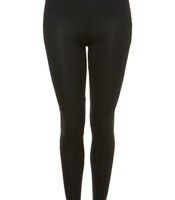 Matalan leggings £6Black leggings are a staple of every girls wardrobe, and even more so if you are pregnant! You can just throw them on in the morning with a long knit and some boots with no effort whatsoever. Leggings are super comfy and if you get the right pair can also look great dressed up for the evening with some heels and a sparkly top.